This is my 3rd and final remix look of the month! I'm so glad I snatched up these amazing heels before they sold out. For this outfit, I styled a more simple going out look. My white top and dark skinny jeans were the perfect canvas for statement heels and a bright clutch and necklace. What was your favorite look?? Mind was the red dress! 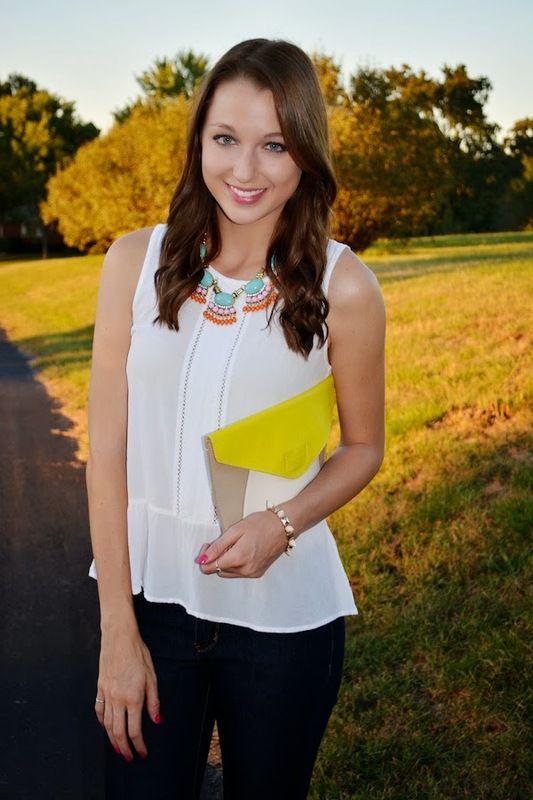 Today is the last way to enter my Stella & Dot giveaway! There will be 2 winners, so don't miss out! I love this whole look - you look so pretty! But those shoes are definitely a standout! You look gorgeous, I love these heels. Love the heels and the necklace! SO stunning! Those heels are amazing! I want to steal them off your feet! All your looks are fab! Really liking the crisp white shirt + dark denim combo-- the heels, clutch and that gorgeous necklace are the perfect accessories! Great job! Those shoes are amazing.